Dallas Cowboys quarterback Dak Prescott offered a clever reply when asked about Philadelphia Eagles linebacker Kamu Grugier-Hill's comments from earlier this week. Grugier-Hill said the Cowboys are going to "choke" in their week 14 matchup. When asked if he had heard Grugier-Hill's remarks, Prescott initially responded: "Who?" The 25-year-old quarterback then went on to say the reason the Eagles are talking trash is to bring attention to themselves. 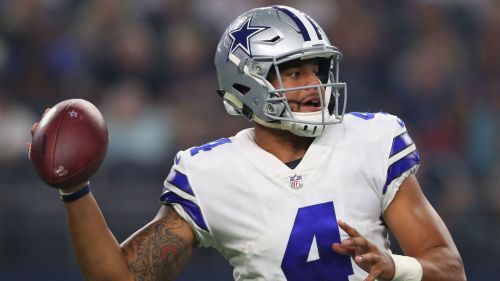 "You know, coach [Jason] Garrett has a great saying, and I don't know where he got it from, but winners worry about winning and losers worry about winners,'' Prescott told reporters, per the Dallas Morning News. "We're focused on ourselves in this locker room about what we need to do to get better in each and every phase of this game to be ready for this week. He added: "When you play a team like this, a game like this that means what it means, what somebody says doesn't add any motivation." Grugier-Hill started the conversation on Wednesday when he said: "Look at Dallas' history, they always choke. So we'll go down there and make them choke." The Cowboys (7-5) are coming off a 13-10 victory over the New Orleans Saints and have won four straight, while the Eagles (6-6) defeated the Washington Redskins 28-13 in week 13. The two faced off against each other on November 11 when the Cowboys won 27-20. Philadelphia are the defending Super Bowl champions but trail Dallas by one game for the lead in the NFC East.